Two years ago there was a demo for a game that grabbed me more than any other game previously. No game had given me over 600 hours of fun for it’s mere $60~ dollars retail price. No game brought the innovation, creativity, excitement, action, charm, and fun like Splatoon. Perhaps games in the past have had more of any one of these at one time but something about Splatoon just nabbed me and shook me and said ‘I have all of these at once you goon!’. It was that point two years ago when I began playing Splatoon and I became both a kid, and a squid. There was a demo shortly before its release which gave the world its first taste of the ink. The ‘Splatoon Global Testfire’ they called it. The Squid Research Lab unleashed it upon the world and I remember trying pretty desperately to be involved in all rounds once I had my first taste of the gameplay. I wrote big ol’ ‘paper’ on it for Negative World called ‘Splatoon Global Testfire: My Impressions of a Nintendo Experient’ and you can read that for your own curiosity here. Much to my appreciation, as we ramp up towards the eventual release of that game’s sequel, Splatoon 2, Nintendo and the Squid Research Lab gave us another Global Testire. These are my thoughts once again. The Global Testfire, for those who don’t know, was a period over the three day weekend of Friday the 24th, Saturday the 25th, and Sunday the 26th, where for six separate one-hour-long sessions, Nintendo would unleash the servers for eager gamers to get their fix and try something new. For the Eastern time zone, those time slots were eight hours apart starting at 3 PM EDT. Thus, just seven hours after the last round, a new one began. This made sleep a bit tricky for anyone like myself who was trying to nab time in all of the sessions. This alone was pretty great though as the original testfire was only half as intensive with it’s three sessions. It was Friday afternoon and all I could think about was getting home to play some of that Splatoon 2 demo. My Splatoon gaming in general has been to a crawl because I took the time to complete The Legend of Zelda: Twilight Princess HD before The Legend of Zelda: Breath of the Wild. Then I spent over 120 hours beating that game throughout the month of March (finishing Breath of the Wild between the 4th and 5th rounds of this Splatoon 2 Global Testfire in fact). I was concerned about being rusty with my skills but also about how the game might be different. Will it feel so similar that it’s second nature or will it feel different enough that I don’t recognize it. Thankfully the answer was somewhere towards the first option, however not entirely. I raced home to get in the door. I was a little late which irked me. I ran into the living room and kissed my beloved stating, “I’ll see you in an hour.” She knew I was coming home for this and she knew what to expect. Yet she gave me a look of dismay when I had such a brief greeting. She was kidding around of course. Off to the other room, just a Curling Bomb’s reach away from her in the room where I keep my Nintendo Switch. Booting up the system was quick as usual and I grabbed my Pro Controller. Comfortable and familiar, it knew I was ready for this. We were ready for this. As the game loaded and I began hearing that music teased in previous trailers I launched the Discord Chat to join some friends who were doing the same. Ploot was the first to hang with the inklings. My first experience could be described as Squid Kid, Splattershot, Final Destination… I mean, The Reef. This time around the demo didn’t allow you to pick your person and instead everyone was a random assortment of colors, outfits, and hairstyles. This was actually a positive in my mind as it helped get folks into the game quickly. The demo itself was even much quicker than before. Everyone had to do it so I’m glad they kept it simple and to the point. In my first matches I went with the Splattershot. As I described to Ploot, “I had to go in and get used to it with an old friend.” In Splatoon’s original Global Testfire I recalled liking the Splattershot but eventually favoring the Splat Roller. Thoughts on how that fared this time soon but over the course of actually enjoying Splatoon itself I grew to favorite the N’Zap 89. In my very first match I found myself sliding accidentally into water and shooting frantically on a landscape I never knew before. Sure I had seen it in the demo videos during Nintendo’s special events but it was still incredibly new. It was The Reef and that could be defined as Splatoon 2’s signature stage. It’s apparently where the squid kids frequent these days. It resembles a city square to some degree but I’m sure with closer evaluation there’s a better way to describe it. It features a lot of areas of ink that can’t be reached normally by your opponents and there are lots of ramps. There’s a bridge in the middle of the arena for connecting the sides and you can go above and below it. Not having a strategy yet on this stage I just ran forth and did my best. It was pretty easy to screw up the controls as muscle memory told me that I should hit X to jump but that is now an action relegated to the B-button. X is now used for pulling up your map. I didn’t use that feature too much but it worked well enough. Hit X, then motion to someone you want to warp to. It’s very fast and can be done in a pinch. Perhaps slightly slower than a gamepad press, it’s a functional solution to a system without a dual-screen setup. However if you’re well versed in where your team is at, you can hit a d-pad button to warp instantly too which is actually faster than the gamepad would be, plus you don’t need to avert your eyes to another screen. In the long term I think I’ll come to appreciate it. Another major thing that was new for me was just using any controller that wasn’t the gamepad. When I fell in love with Splatoon originally, I used the gamepad with motion controls exclusively. I still tout that this is the definitive way too. However with Splatoon 2 there is no gamepad. The Pro Controller is a slick device and I just couldn’t bring myself to try the demo and use precious game time on the joycons or in hand-held mode. So the Pro Controller was my main interface and while the motion took a moment to get used to, the biggest change is just where your ‘center of mass’ is so to speak. With a gamepad, because your hands are farther apart, you need to move them in a certain manner to succeed in your movements. Here, you need to do less so because your hands are closer by a good margin. I found myself adjusting quickly enough but to be honest, more time is needed to feel fully comfortable. I almost need to un-learn some Splatoon gameplay but then again, I feel like jumping back into the original now that Zelda is wrapped up. My girlfriend, EponaEatsCarrots, played via handheld mode in the same room as me on some occasions and seemed to be doing just fine. She found that she had to be in a specific position to feel comfortable so perhaps playing in true handheld won’t be the best when trying to use motion control gaming controls. Back on the session, as I said, I was using the Splattershot. It’s a standard-fare weapon with your average stats. Allow me to take a moment to describe how all four weapons ended up feeling for me. First, allow me to show you them. The Splattershot is your standard weapon. It has decent range and fire-rate. It’s got one of those classic Burst Bombs which are like water-balloons of ink-destruction. All worked well and good and I found myself wanting to come back to this as my second favorite of the demo. The special weapon linked to it this time around was new, as all the specials are. It’s called the Tenta Missiles and what it does is lock onto enemies and shoot homing missiles in the air. I found this to be an exciting special weapon and it was fun nabbing folks from far away. However in practice I found it was pretty easy to dodge. I don’t think I’ll be returning to weapons like this on purpose. After my first five rounds with it I was ready to move on to another weapon, but we’ll get to that one. The Splat Roller is once again your classic roller weapon. Nintendo isn’t trying to reinvent the demo-wheel here but there was something new. Now when you flick with the roller, instead of a shallow and wide spray which honestly made things a little overpowered in the original, flicking now has a longer but narrower spray. I liked this change partially on how the design of a paint roller could allow for this naturally anyway. The change of pace felt fresh and made it a bit more fair I’d say against rollers. Still hated to be splatted by them though. I tried the Splat Roller starting with my second round of the demo and it only lasted four rounds before I was done and moving on. I did revisit later to give it more time but I just wasn’t happy with my own gaming using that weapon. I think it’s a personal preference thing. The secondary weapon on this was the Suction Bombs. Nothing’s changed that I noticed for those. The special weapon though was the Splashdown. I obviously didn’t have much time with this but what it does is turns you into a suicide bomber who doesn’t die. When activated you rise into the air and slam dunk down into your position spraying ink radially in your immediate area. I found that this was good for swimming up to your opponents and sneak attacking them, especially if the Ninja Squid aspect from the first game continues in this one. You can be splatted while doing it if folks are quick but I never was. The Splat Charger was one I didn’t spend too much time with. I like Chargers in concept but I am not the best with them. These levels in particular didn’t have the open spaces necessary to make me feel comfortable. 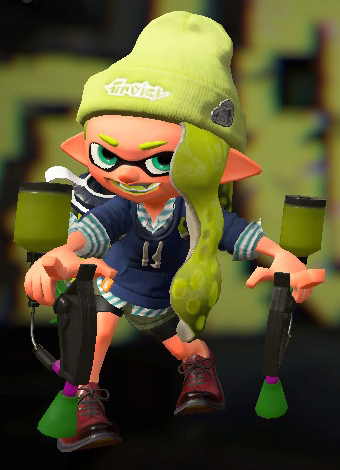 Still, I gave it more initial time than the Splat Roller, and hell, I did really well my first match with it. The Splat Bomb is its sub-weapon and as usual that just explodes when you toss it, with a slight delay compared to the Burst Bombs and with more power. The special for the Splat Charger was the most unique though. Remember in Ghostbusters how the proton packs power those lasers that must never touch? The special weapon here is the Sting Ray. That thing shoots through walls and reaches all across the stage. However there is a delay of nearly a second when turning so if anyone is close to you it’s not the most useful weapon. I nabbed quite a few splats with it which was a treat. My folly was when I was in enemy territory trying to use it. What a Splat-fool I was! The Splat Dualies are the new squid on the block. A dual-handed pair of shooters which actually give you two reticules on screen. You’re not shooting the center but near the center and for that, this weapon has unique coverage capabilities. It feels pretty close to the splattershot and frankly, it’s new attributes really concerned me going in. When the new functionality and the new weapon were featured I was skeptical. When you have the Splat Dualies you can (at any time while shooting) roll quickly out of the way of enemy fire. I was concerned this would make matches frustrating against those who could instantly dodge any attack. It can be frustrating… but it’s just as delicious to dish it back. It’s actually a cool piece of change to the series and just because you can dodge doesn’t mean you actually will survive. Directly after you perform the move though your reticules combine into one concentrated shot, plus you’re stuck in place for a short short moment. It was actually pretty great and I had a few rolling matches with folks who were learning it as I was. New to this weapon too is the Curling Bomb sub-weapon. This is essentially like the homing bomb from the first game except completely not. It doesn’t home in on anyone but it will bounce off walls under standard conditions. It creates a stream of your ink in its wake that you can use to swim through, making the angles even more efficient for gameplay. Also, by holding it before release you can control to some degree when it’ll go off. The longer you hold it, the shorter it’ll go when it releases it’s energy. That never concerned me and luckily it’s just as fun as I hoped. However what concerned me was the jetpack special move known better as the Inkjet. This propels you up into the air with a semi-tricky control scheme as you fly around spraying ink below you and blasting globs of it elsewhere. This can allow you go into otherwise enemy-only territory but once you’re out of ink you fly quickly back to your original spot (helping prevent misuse) and you better hope someone’s not waiting there for you because there’s a marker calling your eventual location. This seemed to be concerning at first but in practice it’s really fun. It’s not incredibly precise to the point of being over-powered and yet it’s still unique and fun to use in your arsenal. Even more fun is when you find another person doing the same thing and you have an Inkjet battle in mid-air hoping to splat them before they splat you. I had briefly mentioned the first stage known as The Reef but there was a second stage on display, known as Musselforge Fitness. Clearly the aquatic punnery is at an all-time high. This stage felt a bit like The Reef but in practice there was some key differences. No, you can’t climb the rock walls, but instead of a valley and a bridge in the center of the stage, now this one had a huge Aggro-Crag-style mountain in the center. This makes for some tricky gameplay since you almost always lack the upper-hand from the vantage-point standpoint. Plus certain areas in the corners are not so easily accessible by all players. Lots of hiding spots, lots of alternate paths for sneaking through enemy offenses… it was my prefered battle map of the two. Lucky for me I suppose, it was hitting a little more commonly for me. In reality I do wish that this demo had more distinct stages in the pairing. When you look back at Walleye Warehouse and Saltspray Rig, those were incredibly different in design and features. It made Splatoon feel fresh and fun and while these stages were both those things, neither felt particularly superior to the other and for that I felt like both felt a little sub-par to my expectations. From my understanding, the game is locked at a max of 720p resolution, even when docked. This might seem like a bummer for some folks but what it allows Nintendo to do is lock the game in at 60 FPS. Digital Foundry did a test of this and found that to be the case. The game is fluid as ever and fastly beats out Splatoon on Wii U in that category. I’m far from a frame-rate nerd or graphic-geek or anything, but even I could tell there was improvement and I appreciated it also. It looks as good visually as the original if not a bit improved so this seems to be a proper middle ground of graphics and gameplay. I cannot complain. All in all this was one stellar demo and I love that Nintendo did it again. I think it’s a pivotal aspect to why the original was so hot off the presses like it was and it helped lay the groundwork for the hype over this demo. Next in our sights should be the release date and future. Nintendo has only officially announced a release date of Summer 2017. Summer would be defined as June 21st, implying this won’t see a release until at least then. However, the first Global Testfire was mere weeks before the actual release of the game and for that, I do not think Nintendo is going to wait until late June or worse to accomplish this release. It’s already clear they are releasing content in waves like with the original to keep things feeling special and paced well. With Mario Kart 8 Deluxe on the horizon for late April, I suspect that Nintendo will want to capitalize on their former success with the ‘out for Summer’ time period. Kids and teens will be out of school in May and early June. This will be the perfect time to strike and attract gamers to the platform. I’ll throw my prediction hat into the ring with this… I announce that I think Splatoon 2 will release on May 26th, 2017. A backup date could be June 2nd. Either way, the first Splatfest for Splatoon 2 will happen sometime in and around the 4th of July weekend in the United States, so roughly 4-6 weeks after the release. How close will I be…? We shall see. I am firm on my belief we will not wait until actual official ‘summer’ before we’re spending our Friday nights playing this. If you’ve made it this far into the article, Thank You. I’m pretty sure I wrote more than I did two years ago for that Testfire and I kind of vowed I wouldn’t write so much. Oops. Alas, let’s get to the stats I took. I made a tracking sheet of stats for my Splatfest endeavors some time ago and I used a modified one of it to track all sorts of things that were calculated for me and relevant to my curiosities. I’ll go over the same stats I did originally as well. Here you go. I was pleased and lucky that Nintendo gave us six hours this time around instead of just three. Even with this I hope for more before the game’s release. They only made you do the demo once which was nice as well, unlike before where it had to be cleared each time. In my first round I had over 75% of my matches as wins but that dwindled down to 66% by the end of the run. Still, roughly two out of every three matches being winners, that’s a fun couple of hours indeed with just enough loss to keep me on my toes. I did track the colors again of the teams. This time around we saw two versions of yellow and a seafoam green. Besides that all the original colors returned. It seems that Pink was the most popular this time around. Close behind that was the color Purple. The least common color I saw was Seafoam Green for the Good Guys and Light Blue for the Opponents. As usual, these are stats that seem crazy to track but are actually really simple to do so with my sheet. When judging how well my teams and I did, I don’t just look at if I won more than half my matches but it’s nice to see that my overall Win Percentage was higher than the opponents. So on average, when I won, I won better! lol These are the things that make me feel good when finally putting the controller down. The gap there was fascinating. Two matches came down to 0.10% differences. The first one that this happened to, I lost. What a bummer! Then we had another match. Then the one after that we had yet another 0.10% close match but this time I won! The craziest thing of it all was that the percentage of the opponents was the same both times; 42.2%. Regarding the untouched land, this is always fascinating to think about too. I wonder if anyone has EVER nabbed 0% on this for a true match but to think that at one point over 95% of the map was covered with someone’s ink is crazy. Sometimes the strategy is to cover every little patch when sometimes you want to rush the opponent and neglect your own side in hopes of halting their own progression. I love Turf War and these stats are just another way to look at it. In summary, this was a ridiculously fun time and it just hits the tip of the iceberg of fun that’s to be had. This is my most anticipated game right now, well beyond even Super Mario Odyssey. SMO will be incredible surely, and perhaps it’s due to the proximity of release, but I am just so madly hyped for splatoon 2. I hope you all got to try out the demo to some degree. It’s worth dabbling in. I even received a text from Ninsage in the fourth round stating “I just played my first round [of] Splatoon ever!” So if he can do it finally, so can you. It’s never to late to be a squid kid. I’m craving this game more than ever and I hope you all found at least some kind of entertainment from the demo and this article. I’ve got squid on the brain and I don’t want to be anything else. I’ll leave you now with a few choice quotes from the Discord Chat sessions and my adorable self. This goes to show how much you love stats and Splatoon! Great write-up. I just wish I was able to participate in more than 1.5 test fires. Ah well! Nice! Where did you see the stats? Or did you calculate them on your own? I think I played in a half-dozen, and my brother in law (who is a Splatoon addict) played in over a dozen. Great write-up! I had no idea that you played the first THAT much. I know I've put a bit more than 100 hours into which was already a ton more than I expected for a multiplayer game of this sort. I agree about the stages being too similar this time around though once I got the hang of it as a charger, I could still find there was some good, "safe" spots where I could get in some shots and hold back the team while still getting good coverage as well. I haven't tried the other weapon types but I like some of the changes they bring to the mix. It's good that they keep it feeling similar but I expect the final build will have quite a lot of variation with the weapons too. Hoping for more new types! Looking forward to playing with everyone once it releases. Glad you enjoyed it and are so excited! If not, I really am glad for you guys who have taken it like a squid to water! EDIT: If anyone here is "too good" at the game (looking at you, Fink) I will be on your team to drag you horrifically down. That seems like a fair handicap. The stats were generated by my spreadsheet I developed back in the Splatfest days. I was taking screen grabs during each match which made it really easy to go back and plug numbers. Took less than 15 min to fill out. I just had to type the Weapon Used, Stage Played, My Color, Their Color, My Percent, Their Percent, Splat Count, Death Count, and Point Tally per match. Sounds like a lot of data and I guess it is, but it fills out super quick. I'm not a slow typer. Once that's in there for each match, it'll average all these stats based on the rounds I played and it automatically tallies that too. 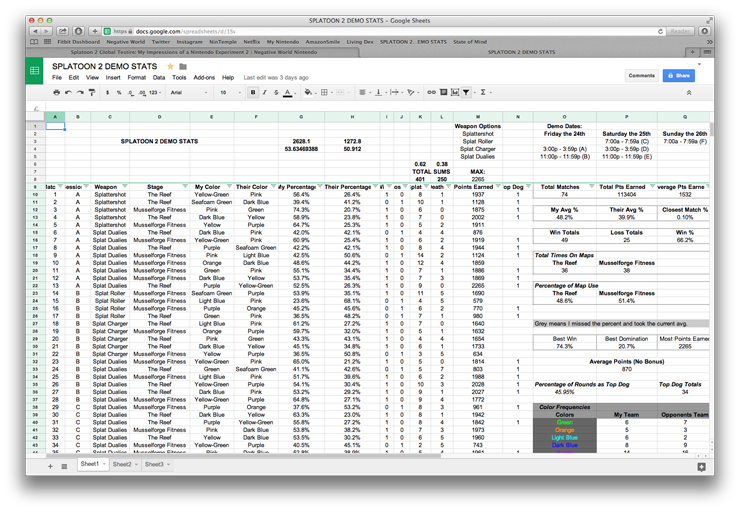 Here's a screen grab of what that spread sheet looks like. I'm particularly curious about other new weapons a la the Splat Dualies. They must have one or two more at least… And I do look forward to more Charger fun,.. but once I'm not keeping score, lol. I'm not strong with them. If the game is anything like Splatoon on Wii U, you'll find a traditional ranking system with the Ranked Battle, so you might actually have fun with that since they should only pair you up with others of your rank. Play well enough and you'll move up so either you'll get better or you'll get knocked back down and keep playing those at your experience level. Main Turf War gets ranked via experience points more or less, but if you play enough this means you'll eventually be with all the strongest players regardless of skill level, but then again, your skill should improve if that ever happened. Hoping you find enjoyment from it. I give you props for buying it on pure spirit of the hype surrounding it and the friends of yours who appreciate it. I hope it grows on you. As I said in that other thread, I hated Halo once and forced myself to train enough to be good at it, so I know I CAN do this... It's just a matter of if my brain has deteriorated in my "old age" and can learn a new trick or two, ha ha. We shall see. If nothing else, I will wander through single player and paint walls or something, because that was really fun in the demo. I just didn't like the "being killed while I was painting walls" part! Nice write-up, sounds like it was a fun time. I don't have a Switch yet so I missed out, but Splatoon 2 will be a system-seller for me, no doubt about it. Not sure what to think of the splat roller changes, I will have to test it out for myself I guess!